Summary: The first Sonic restaurant has opened in Pittsburgh, meaning an end to years of head-scratching by locals who have been asking, "Do we even have one of those around here?" after viewing one of the hilarious TV commercials. Station: WTAE Channel 4 Reporter: Ari Hait When it Aired: Oct. 5 Running Time: 1 minute, 34 seconds Visuals: * The parking lot at the new Sonic Drive-In restaurant, which is cluttered with promotional signs. * Hait chewing the fat with a drive-thru customer. Highlights: * When anchor Michelle Wright heralds, "There's a new restaurant opening today, and it's not the beginning of new business for the area -- [Hait] brings you the grand openin'." * When Hait says, "It didn't take long for word to get out that the Sonic is now open here at Pittsburgh Mills -- when the lights came on at 5:30 this morning, the traffic started coming through, and it's been coming through pretty steadily ever since. The owners say they can only hope that will continue." * When a young man in a car tells Hait, "I'm gonna get a number eight, the breakfast burrito." Hait emits the obligatory chuckle: "You've been thinkin' about this for a while." The man in the car responds, "Yeah, I saw the commercial, like a year ago, for the breakfast burrito. I can't wait to get one." Now that's anticipation. * When the owner exults, "It's just amazing. People are just in love with Sonic. It's just a brand that people just love to be around." * When Hait touches on the opening's economic impact: "When Sonic asks, 'How can I help you?' it means something much different to Pittsburgh Mills. When the mall opened in July of '05, it did not do nearly as well as expected; some stores even closed quickly. But last December, a new ownership group took over and started bringing in new stores. Sales are up; so is customer traffic." * When Hait wraps, "Developers are so confident in the success of Sonic, they already have plans to put 30 of the restaurants in our region within the next six or seven years." What We Learned: That "meals on wheels" aren't just for the elderly here anymore. Unanswered Question: Could the chain's popularity have anything, anything at all to do with advertising? (Hint: Yes!) News Value: 4. Hait's fairly bland report could have used some of the flavor the Oklahoma City-based chain restaurant is famous for (there are 168,994 possible drink combinations). It wouldn't have hurt to mix up the typical "grand opening" story formula a little and give us something to really drink to. Summary: A dognapping may have occurred in Belle Vernon. 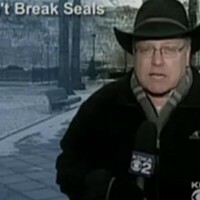 Station: WPXI Channel 11 Reporter: Stuart Brown When it Aired: Oct. 2 Running Time: 1 minute, 41 seconds Visuals: * Brown at the scene of the crime. * Portraits of "Taz," the dog that may have been "napped." * Other dogs at the home. Highlights: * When anchor Peggy Finnegan begins, "New at 5 -- a doggone mystery. Was this animal stolen, or did it just run away?" * When anchor David Johnson adds, "Somebody had broken in [to the owner's apartment], but no one's sure if the crime is actually related." * When Brown reports, "[This young woman] has owned this Pomeranian named Taz for 10 years, but now, he's either missing or stolen. [She] says a friend gave her the dog when her sister died in 1997." * When the woman cries, "He was my only companion." * When Brown conveys, "The dog lived with [the woman] and her mother at their Belle Vernon apartment. Police believe a burglar may have broken in Monday when [the woman] said she and her mother went out. When she and her mother left their house Monday afternoon, they shut this door. She says the Pomeranian was inside, along with two other dogs. One is this miniature pinscher named Mona. The other is this big pit-bull mix named Sam. Police believe Sam may have scared off any intruders, who then could have left the door open for Taz to run out." * When a police officer details the investigation, "We had checked for fingerprints, we had dusted the scene, we looked for markings at the door to see if we could get any kinda lead on what might have happened. We couldn't find any." * When Brown says, "Monday night, a Pomeranian was found in North Belle Vernon, but it turned out not to be [the woman's] pet. She's appealing to anyone who finds Taz." What We Learned: If you ever have a missing pet, by all means, call the local TV news and tell them all about it. Unanswered Question: What -- not enough fires, firings, crashes, Ravenstahl-crashing, landslides, landlord problems or shootings that day? News Value: 2. Poor Stu. Can you give this guy a real assignment? Minutes after the story aired, WPXI reported that dog and owner were reunited. No word yet on whether the dog wandered or was muttnapped. Stay tuned!